Start reading From Pusan to Panmunjom (Memories of War) on your Kindle in under a minute. "This is the first major South Korean interpretation of the conflict to be translated into English, and thus fills a void in the literature." Presents a wartime memoir of the soldier who, at the age of thirty-two, became South Korea's first four-star general. This book provides a perspective to a cataclysmic war. In most histories of the Korean War, the Korean army tends to be overlooked except with respect to their combat abilities, or lack thereof. However, this is a harsh assessment, and it should be noted that the Korean army put more troops in the field than the United States, the United Kingdom and Canada combined. So while it could be considered that as a whole, the Korean army did not perform particularly well in combat, they did bear their fair share of the fighting, and this is reflected in their losses. However, there were units of the ROK army that were militarily capable, and these obviously tended to be units led by the competent officers of the ROK army. Paik was one such individual, who is regarded by Max Hastings in his book "The Korean War" as being the "ablest South Korean commander". 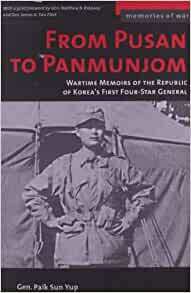 "From Pusan to Panmunjom" is the story of Paik's war, which stretched from the beginning of the war as a field commander to its conclusion, just over three years later, at which time Paik was Army Chief of Staff, and a four star general. General Paik Sun-yup was commander of the 1st ROK Division at the time of the North Korean invasion of the South, which commenced in June 1950, and it is these early days of the war which form the initial portion of the book. Paik remained in command during the counteroffensive, and led the 1st ROK division into Pyongyang. This was significant for Paik, who had been forced to flee the city in late 1945 when communists threatened. Paik then proceeded onto the Yalu. Of course, the course of the war was quickly reversed upon entry of the Chinese into the theatre of war, and following the retreat of the allied forces, the war settled into a stalemate. Paik, being involved as a field commander throughout the entire war, is ideally placed to comment and provide his views and experiences on all the major actions and phases of the Korean War. Paik provides a mixture of command and field level experiences - ranging from interrogating Chinese POWs to having a telephone conversation with a frightened North Korean soldier defending Pyongyang as the 1st ROK Division approached from one direction while the US 1st CAV approached from another. There are also interesting accounts of the interaction with American forces. The great value in this book is the Korean perspective of the Korean/US relationship. It seems that, contrary to the generally accepted view, there was a great deal of respect between the American units that supported the 1st ROK Division (which admittedly was one of the most, if not the most, capable Korean unit). Nonetheless, there were difficulties in the Korean/US relationship, and Paik does tend to tiptoe through these carefully. Unlike some memoirs, there are a few (large scale) maps interspersed throughout the text that assist the reader in understanding the movement of various units. There is also a selection of black & white photographs. Generals Ridgway and van Fleet (Ridgway's successor as commander of the US 8th Army), both of whom worked with Paik, contributed a foreword. At times, the language tends to be relatively formal - but every now and then Paik breaks into a more casual turn of phrase. "From Pusan to Panmunjom" is recommended for all those interested in the Korean War - this book offers a Korean perspective on the events of the war, a perspective which is in contrast to the multitude of US-centric books on the Korean War that are available. Paik Sun Yup's book was for me often hard to read. At times I literally shook with emotion. I was 18 when my regiment was assigned to temporary duty in Korea as support troops. I was stationed in Pusan. While there I was able to move about and ended up with a very good impression of the people of Korea. I heard both good and bad about the ROK army. From Matthew Ridgway's book The Korean War that the bad reputation came from an unfortunate source. President Syngman Rhee offered Ridgway troops that unknown to him were not trained. They were sent to the front with rifles. When they saw the enemy not knowing what to do they dropped their weapons and ran. This happened for than once. Thus people got a bad view of the ROC army. These men were willing to fight for their country but without training they could not. Ridgway did give credit to the trained units of the ROC army. I was impressed with General Paik Sun Yup. He wrote not only of the things he did right but also things he did wrong. Only an honest man does that. I recommend this book to anyone who is interested in the Korean War. General Paik had an incredible career, from being an officer of the Manchukuo Imperial Army, engaged in Anti-Japanese resistance in Manchuria, then joining the Japanese campaign on northern China, returning to Pyongyang only to flee south since rising communists threatened his safety, then being commissioned a First Lieutenant in the Constabulary, the predecessor of the ROK Army, and then rising quickly to Lieutenant Coronel at the beginning of the Korean War heading a Division, again rising to 4-star General within 3 years and becoming Chief of Staff of the ROK Army. I don't think there are many other examples of such an incredibly fast rise in the ranks of an Army, probably possible only during such exceptional circumstances as encountered in the Korean peninsula during and after WWII and the Korean War. This book presents his view on the Korean War, the events leading to the surprise attack by North Korean forces on June 25, 1950, the campaigns during the war and a quick look at his years after the War. Due to his position in the Army during the War (Division Commander, Corps Commander, Field Army Chief, Chief of the Staff), the book reflects the war from this rather high perspective. You will not find tales from trenches in the book, the closest you get to the foot soldier is at Regimental level! Having said that, General Paik comes over as a "leader from the front", trying to keep a close contact with the Operational Commanders under his responsibility, keeping his HQ as close as possible to the front. He also succeeds in presenting the sometimes breathtaking speed of the movements of Regiments, Divisions and Corps in a clear and concise language, so that even considering the too few and sparse maps it is possible to follow the course of the war without any mayor problems (I found myself most of the time skimming pages back to find the last map). This kind of book needs many maps, particularly with the many movements and (for the first year of the War) ever changing frontline. The reader is allowed a look into an otherwise little know world of field commanders in war, coordinating between many different units and nationalities (many years before the first Gulf War coalition), as well as seeing (for the first time) from the ROK perspective their contribution to the War effort, both positive and negative. The book was originally written in Korean, and I suspect mostly aimed at a Korean audience. Therefore, sometimes the translation gets a little too literal and the sense of the sentences is lost or not correctly conveyed, but overall it does not really detract too much. The unique Korean perspective of this War makes this book and absolute must for anyone interested in this War, but you need to know that the book is centered on the larger scale of units, written by a General - recommended. Gen. Paik's book is much overdue and I feel that it gives much overdue credit to the ROK Army that history seems to have passed by or omited. I served in Korea in 1957-58 with a helicopter company. Not to long after I joined the company we recieved about 50 KATUSA (Korean Augmintation To the US Army). This group was commanded by a Captain who had several NCOs and the rest were raw troops. Our job was to include them into our company by teaching various jobs such as refueling aircraft. While most of them had never been around vehicles let alone helicopters they learned fast and became a very important part of the company. Based on what Gen. Paik says I now understand how this came about. I know that the ROK Army at the start of the Korean war was on the short end of a very long stick militarly. This book opened my eyes on how this force progressed to the point that when ROK troops were sent to Vietnam they performed outstanding service. In Vietnam I again had the a chance to work with ROK troops and they were great. I think that one important point needs to be made in comparing the South Vietnames Army with that of ROK. We tried to do much the same thing in Vietnam as we did in Korea, develope, train and fight a army during combat that for the most part had to start from scratch, we made it in Korea but not in Vietnam. The fact that when he was Chief of Staff Gen. Paik seems to have kept an open mind on how to improve his Army, I am not so sure that was always the case in Vietnam. As a old soldier myself, Gen. Paik come across not only as a good commander but as one hell of a soldier. I LOVE this book. Gen Paik's amazing story is a must read! From very impoverished beginnings, Paik became at a young age South Koreas first high ranking general. So greatly appreciated and reveared by both Gen Ridgway and Gen Van Fleet, together they wrote a spectacular introduction to this book. Paik is able to give us a great deal more information behind the South Korean ROK Army, which for too long has gotten a very poor and unjust rap. Let Paik help you have a clearer view of what things were going on in their sector and the reasons behind unfortunate problems as the massive in waves attacked them and United Nation Forces also in their sector. Gen Paik's story is very informative and fills in a great number of Korean War blanks. Gen Paik is a Soldier/Statesman the Republic of Korea should hold in the highest esteem. He served his country in its greatest hour of need with upmost honor and professionalism. His contributions are without doubt unparalleled in Korean history. This book, a first of its kind, gives insight from the Korean soldiers perspective of the terrible sacrifices required of them and their struggle to recover from the early reversals due mainly from the USG neglect to properly train and equip an adequate force to repel the NKPA. Thank you Gen Paik for helping to set the record straight.